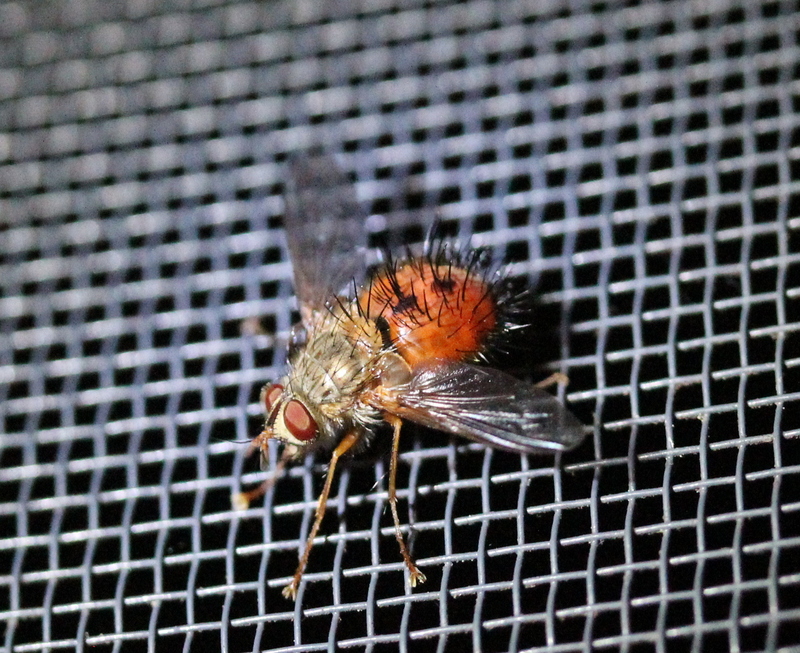 I think this slightly menacing fly is Hystricia abrupta, a parasitoid (some number of moth caterpillars are possible hosts). Attracted to lights, 2018/06/23, Jaffrey NH. 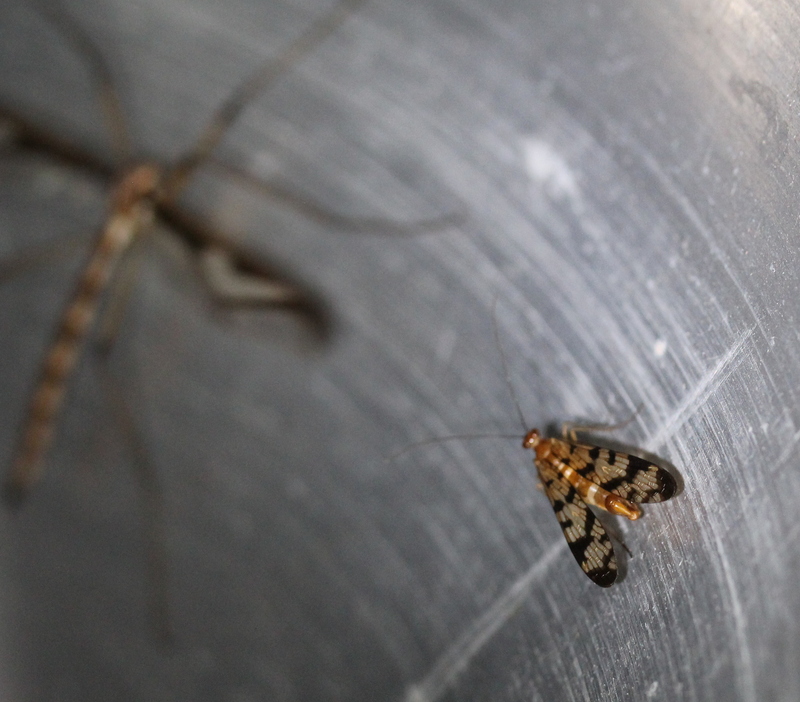 Some non-moths that were attracted to the lights at Jaffrey. 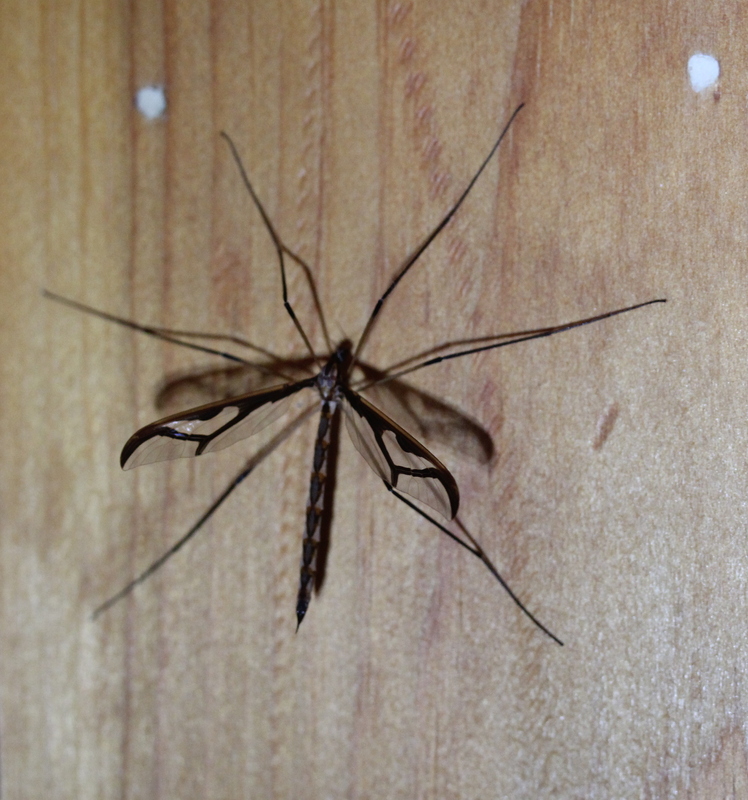 The Giant Eastern Crane Fly (Pedicia albivitta) were quite common, both in the house and at the moth trap. 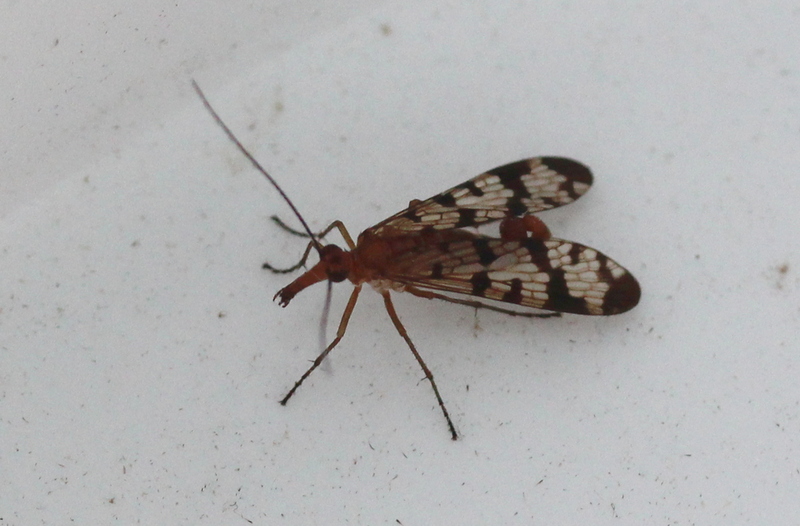 Later, I saw and caught a fly with intricately patterned wings - it's a Scorpion Fly (Panorpa Sp.) 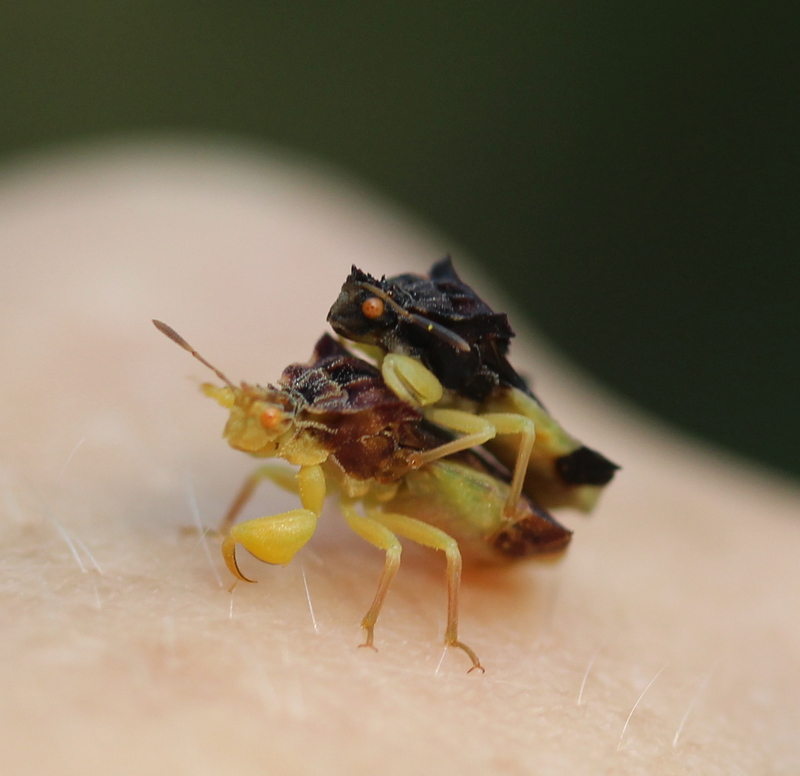 - named for the curled abdomen, but completely harmless. I would like to get back to the moth habit, but the pickings have been thin - a weekend travelling to visit kids (and rainy nights), a weekend home in Somerville, ordering a replacement blacklight bulb for my moth light. Anyhow, I went out to the Fells yesterday just to walk around and found these. 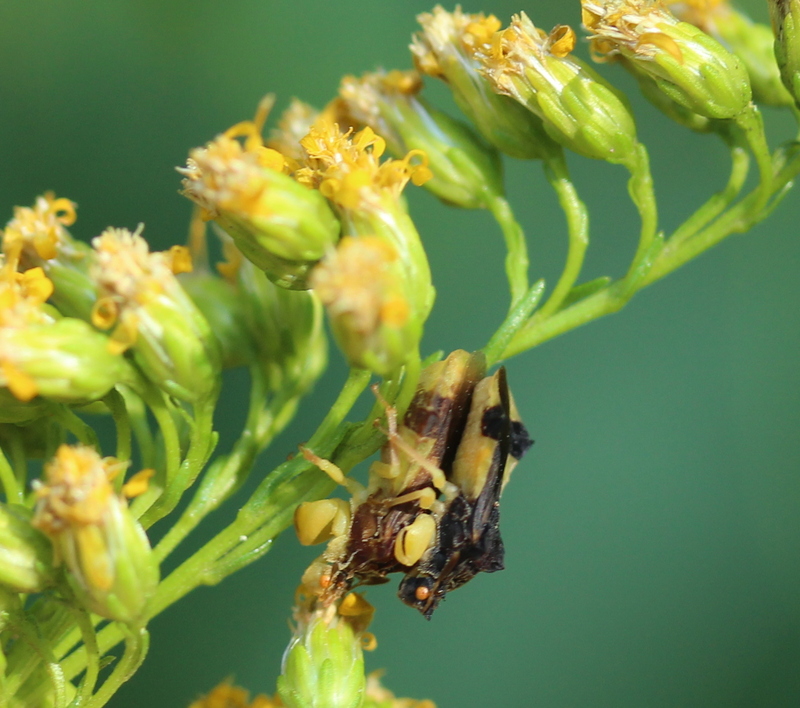 They seem to be Jagged Ambush Bugs (Phymata sp. 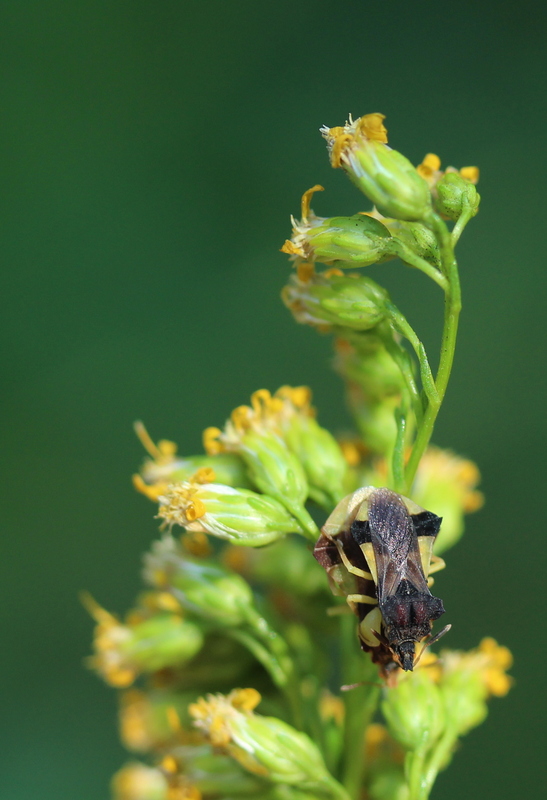 ), but getting the ID closer than genus seems dubious with available materials. 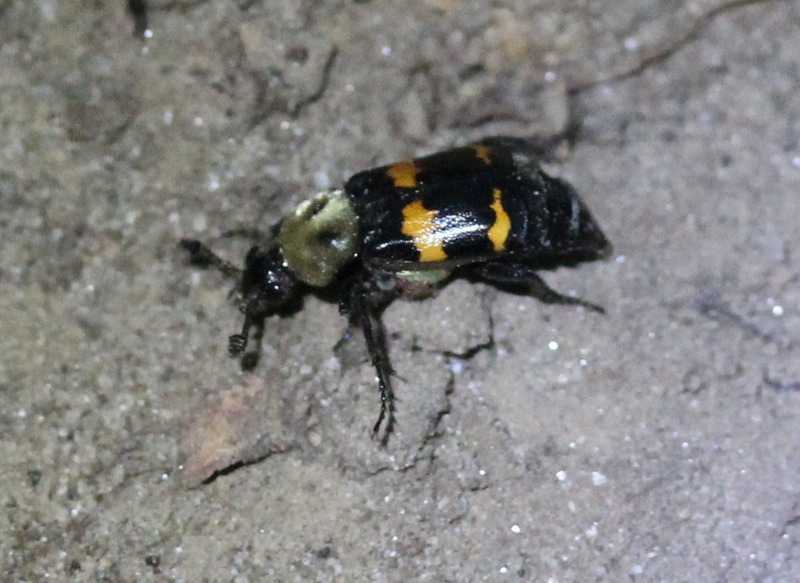 Out hiking in Carey park in Jaffrey, I came upon several of these brightly colored beetles at a mouse carcass. 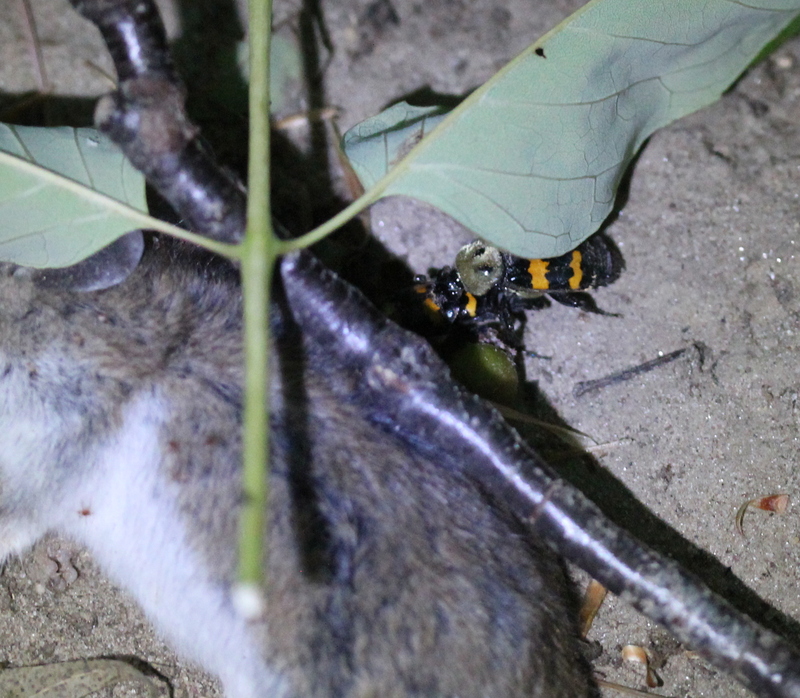 They were quite busy, often running out from under the mouse and taking little loops around and back to it - the carcass moved quite a lot when they went under, and I think the twigs on top had been recently placed there by the beetles. I think they are Tomentose Burying Beetle (Nicrophorus tomentosus). Jaffrey, NH, 2016/08/28. 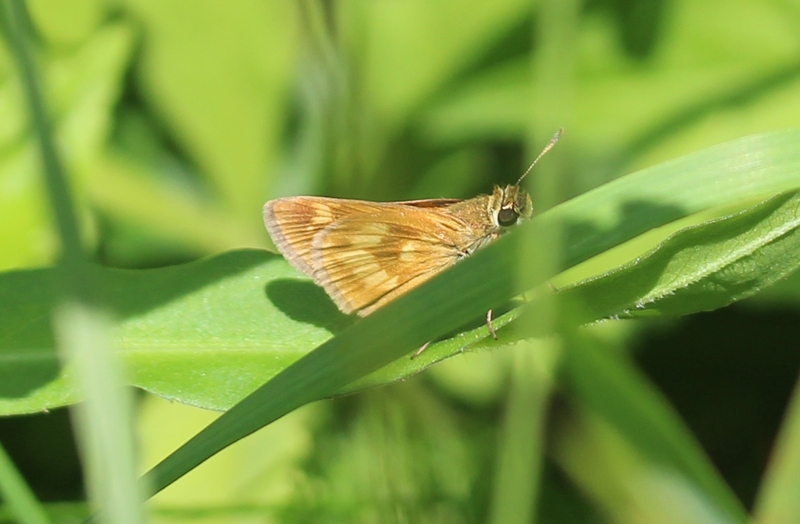 Here's a slightly obstructed view of a small skipper. I think it's Long Dash (Polites mystic) but I could believe it to be a Peck's Skipper (Polites peckius) - I don't think I have a view of enough other features to be sure. Seen at the Warren Fish Hatchery, Warren NH, 6/26/2016. 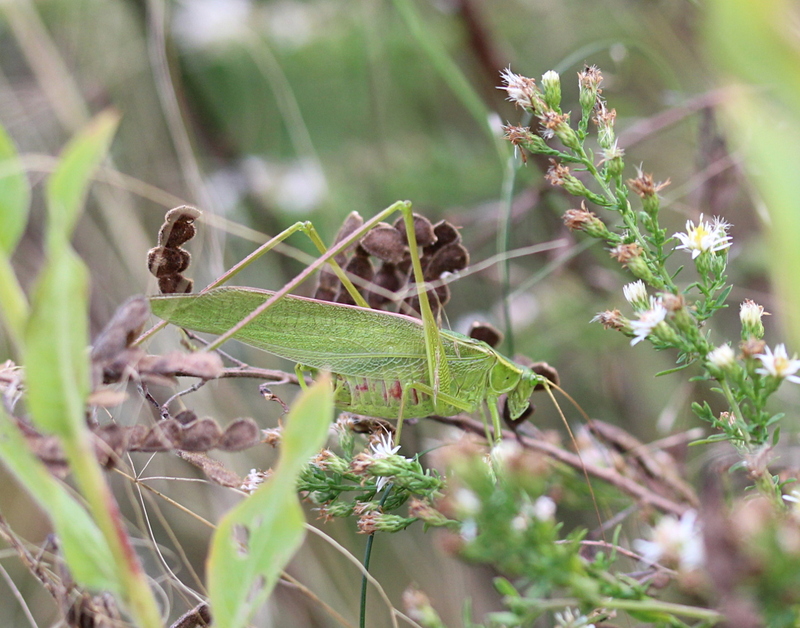 So the previous was an angle wing katydid of some form, this one is one of the bush katydids (Scudderia sp. ), but I didn't get a photo that will narrow it down enough. Bug Guide tells me that it's important to see the "terminalia" for species identification here. 9/12/2015, Concord MA. I'd biked all the way to Great Meadows NWR in Concord, after setting out along the Minuteman without a destination clearly in mind. 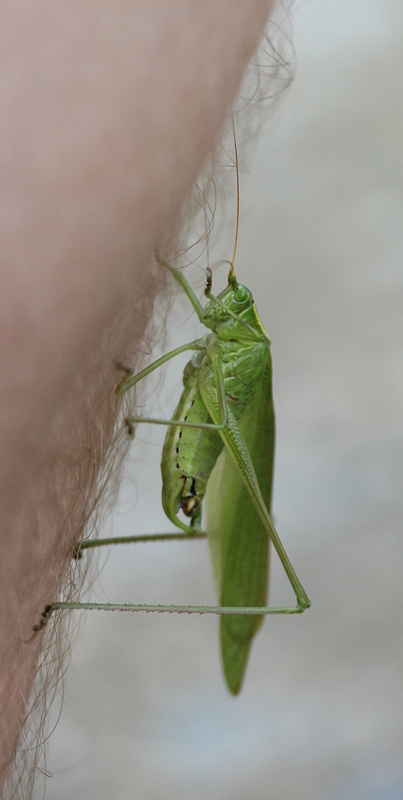 I came across a katydid behind the kitchen door last night, and caught it in my hands. It seemed quite willing to walk over my hands, and sometimes sit and preen its antennae, though it also made a few short distance launches within the house. This photo is Monty's and it's shown on Monty's fingertips; the lighting was poor in his room. I don't think I have the "what to look for" to identify these to species. 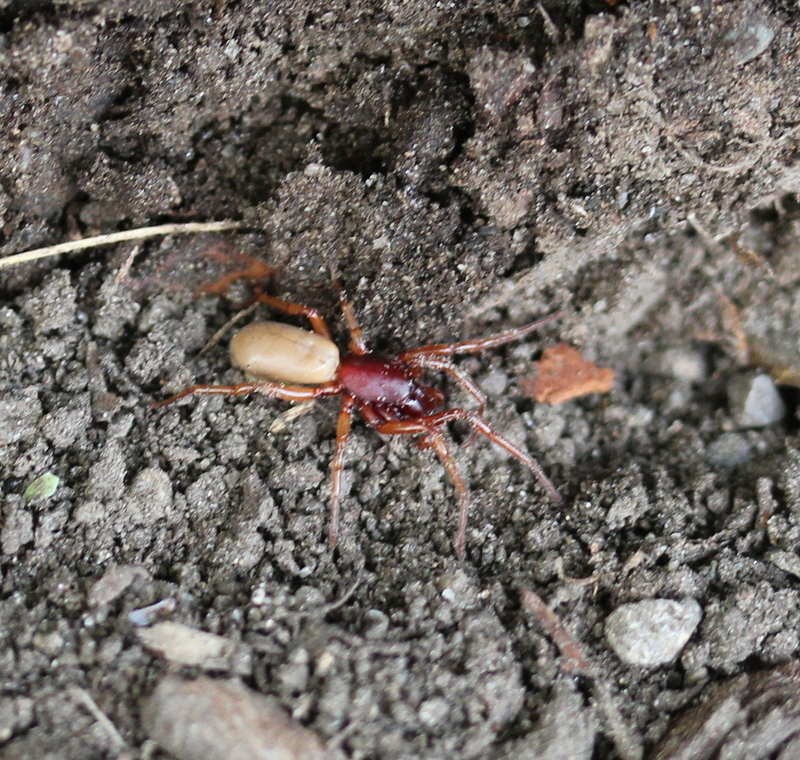 In honor of my new camera, I bring you a poorly executed photo of a Woodlouse Hunter (Dysdera crocata) - Medford MA, 8/16/2014. George and I went to Brooks Estate, and were turning over logs in the stump dump, and came upon this large and active spider.